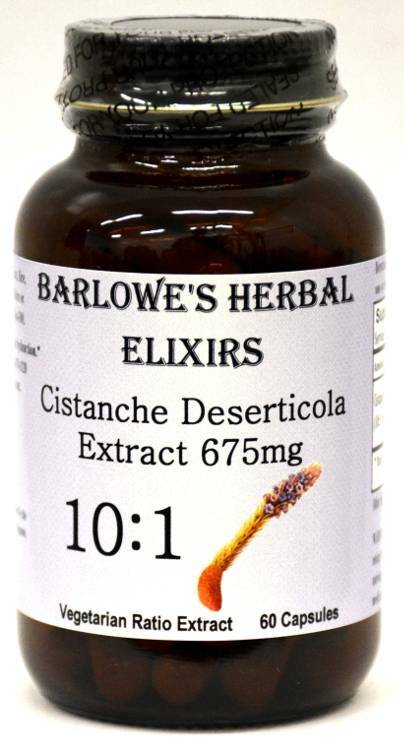 Barlowe's Herbal Elixirs proudly offers a hard-to-find 10:1 Cistanche Deserticola Extract. Cistanche has a documented use in Chinese medicine of over 1800 years. In modern-day Chinese herbalism, Cistanche is utilized for the treatment of lack of libido, weakness of the loins and knees, and infertility. Bottled in Glass! No Stearates! No Fillers! No Junk! 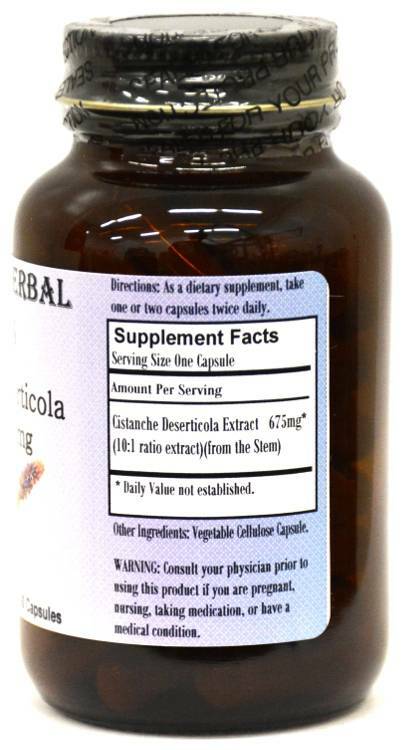 Barlowe's Herbal Elixirs proudly offers a hard-to-find 10:1 Cistanche Deserticola Extract. 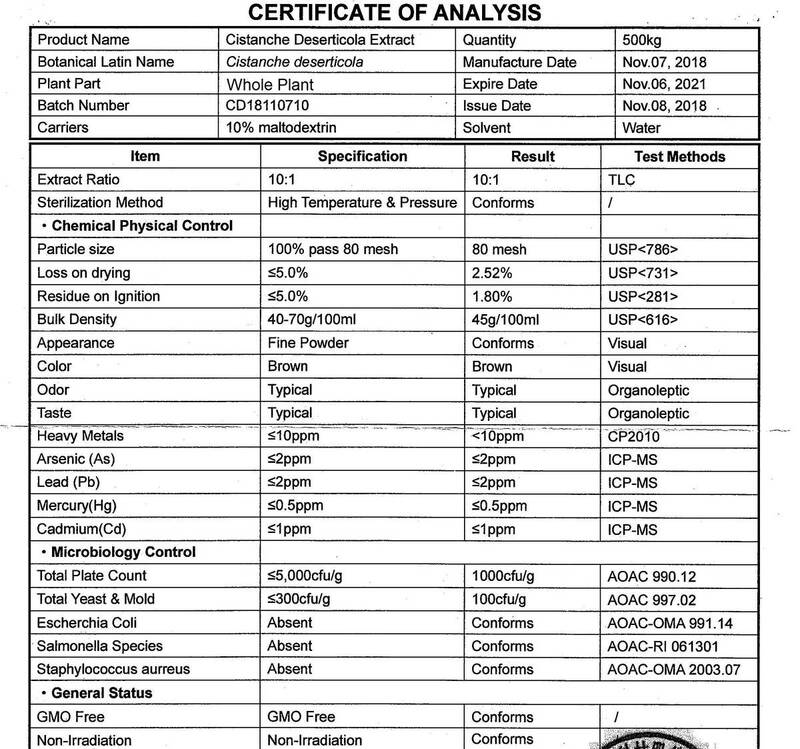 The Cistanche Certificate of Analysis (COA) of this particular batch is shown above. Cistanche has a documented use in Chinese medicine of over 1800 years and it is recorded in the "Shennong Bencao Jing" and the "Bencao Gangmu" as a tonic. In China, Cistanche is known as Rou Cong Rong. In modern-day Chinese herbalism, Cistanche is utilized for the treatment of lack of desire, weakness of the loins and knees, and infertility. Bottled in Glass! No Stearates! No Fillers! No Junk! Research conducted jointly by a Japanese company, a pharmaceutical laboratory in Shanghai, and the University of Beijing, showed that Cistanche Extract helps prevent aging of the brain and skin, increases virility, and accelerates fat metabolism. When given to mice, it improves their learning and memory function. It improves brain function apparently by restoring neurons damaged by apoptosis, by increasing the number of neurotransmitters in the brain, and by increasing the oxygen supply to the brain. It shows strong anti-aging and anti-fatigue benefits and does improve libido, particularly in stressed subjects. Directions For Use: Take two or three capsules daily on empty stomach. For some people, dosage may need to be increased as results and usage amounts vary based on body type and weight.